I Heart JHD utilises three-dimensional modeling and animation software for digital textile print design. It reinterprets Single Stem (C. 1880), a block printed wallpaper design by John Henry Dearle of Morris & Co., examining both its complex composition and also how three-dimensional form is effectively represented through flat, separated colour. 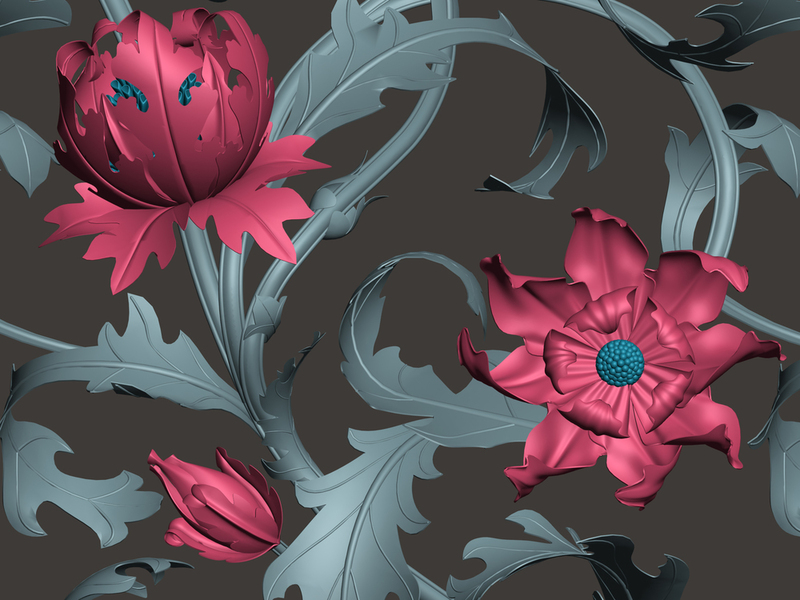 Following Dearle's composition, I virtually remodelled the design in three dimensions and then took advantage of the software capabilities to further manipulate it, altering the angles and curves of the blooms, and entwining leaves and stems. The resolved work promotes the use of refined repeat pattern methods developed for manual printing to inform and enrich digital design process and outputs.